Suitable for surface installation (ceiling or wall), indoors or outdoors. IP66, IK10 LED moisture proof luminaire: protection against dust and powerful jets of water. Electronic, fixed output or DALI dimmable control gear. Class II electrical. Opal or clear diffuser. 4000K; CRI>80; lifetime L90@50.000 hours. High efficiency up to 141 lm/W; UGR<25. Designed for BESA installation. 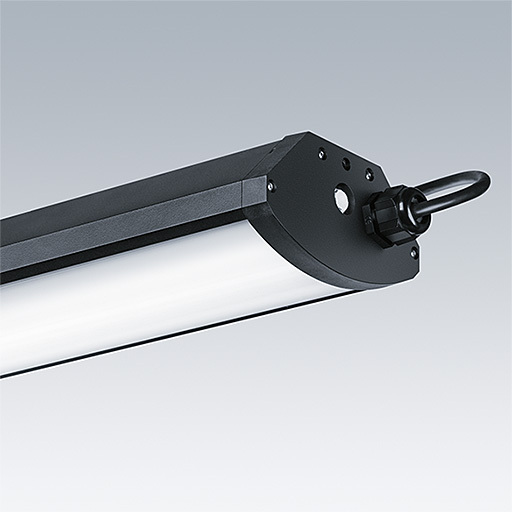 Lengths: 600 mm (fixed output only, 2.000 lm and weight: 3,3 kg); 1200 mm (5.000 lm and weight: 5.15 kg) or 1500 mm (10.000 lm and weight: 6,1 kg). With built-in through wiring and optional Wieland connector. Chromaticity tolerance between multiple luminaires of up to 3 MacAdam ellipses. Ambient temperature range -40°C to +50°C.